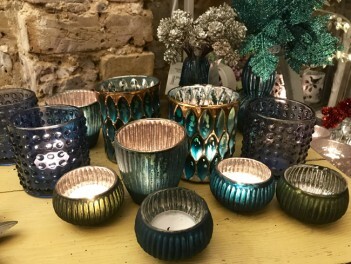 A Collection of Blue, Green and Gold tealight holder. The largest are gold with deep turquoise dimples £5.95 each. The small matt teal coloured ribbed tealight holders are £3.95 each and the smaller matt teal and dark green tealight holders are £2.95 each. Blue Bobble Tealight Holders can be bought under their own listing.